Top of the Form was produced bt the BBC in the UK. Its a programme that began on Saturday 1 May 1948, as a radio series and eventually made it onto the television as a childrens programme. 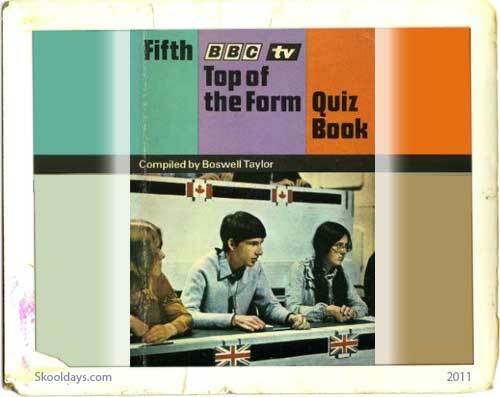 The Childrens quiz series ran from 1962 to 1986 with various presenters including Bob Holness famous for his quiz Blockbusters along with Richard Dimbleby and David Dimbleby. Judith Chalmers was originally lined up to co-present, but was vetoed by The Powers That Be on the grounds that a woman wouldn’t have the authority required of a questionmaster. It enabled two schools to enter a team of four pupils ranging in age from under 13 to under 18. Initially Grammar-schools were entering, with only occasional presence of “new” comprehensive representatives. Prize was simply “taking part”,and winning of course. Many pupils were no doubt seen again a few years later on a larger version of Top of the Form, namely University Challenge. This entry was posted in PrimeTime and tagged 1940, 1950, 1960, 1970, 1980 by Skooldays. Bookmark the permalink.